At Routes Youth Centre, we like to think of ourselves as a hub. Youth from all over Dundas Ontario come to Routes for many different reasons; the majority of which all begin with a conversation. Routes Youth Centre is a drop in and mentoring centre for youth aged 8-19. We spend our days engaging in conversations with our youth. Sometimes these conversations might seem mundane or surface level but it’s these friendly, light conversations that lay the foundation for also having those more in depth and trusting conversations. These more serious conversations happen often in our space because we make a point to start them! Routes is a community where talking about mental health is encouraged, constructive, honest and most importantly safe! Youth of today are experiencing depression and anxiety younger and younger and having these conversations with them is crucial! Routes will be presenting our very own #ConvoPlate at our Fundraiser Dinner & Silent Auction, Friday February 24th 2017. 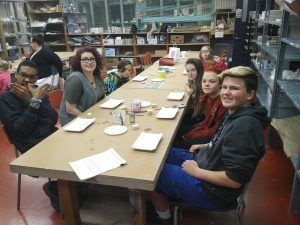 The opportunity to travel to the Art Gallery of Burlington to work with the Paul Hansell Foundation in creating our very own #ConvoPlate was a very important experience for many of our youth! Creating their own #ConvoPlate made them feel empowered in engaging in their own conversations about mental health at home and in their communities. Routes will be presenting our very own #ConvoPlate at our Fundraiser Dinner & Silent Auction, Friday February 24th 2017. The theme of the event is youth mental health and titled “Youth Under Pressure”. To purchase tickets to our fundraising dinner call 905-929-0572. Routes Youth and Staff are very grateful to the Paul Hansell foundation for providing funding to allow the trip to Burlington to be possible, and to Brian Hansell for the important work he is doing in the community!